Co-director Ed M. Koziarski wrote an article about Uncanny Terrain for new Spanish magazine Dar Lugar. Here are links to the article, followed by the original English text. Chin whiskers newly shaved for the campaign, shaggy-haired and bespectacled like a young professor, Asami is an organic farmer and part-time sake brewer, a first-time candidate with no money or connections challenging an incumbent mayor from Japan’s increasingly dominant center-right party. Like a growing minority across Japan, Asami is calling for a quiet revolution, energized by lessons from the meltdown of the Fukushima Daiichi Nuclear Power Plant three years earlier. Fifteen years ago, Asami left a promising career in international steel sales. He bought an old farmhouse and leased mountain rice paddies too remote for his elderly neighbors to cultivate. “I was worried he would never find a wife after that,” Asami’s father confided to me at Asami’s campaign headquarters. His father was relieved when Asami married Harumi. They were raising their two young daughters as self-sufficiently as they could, growing their own food, living simply, minimizing their energy footprint, building a community of like-minded small farmers at their community farmers market. My wife and filmmaking partner Junko Kajino and I first met Asami after the March 2011 earthquake, tsunami and nuclear meltdown ravaged northern Japan. We interviewed Asami on his farm for our documentary Uncanny Terrain. His was one of many families divided by the crisis. Kitakata is 130 kilometers from the nuclear plant, in the northwest corner of Fukushima Prefecture. The radioactive plume that spiraled out from Fukushima Daiichi brushed Kitakata, elevating radiation here to levels similar to those in Tokyo. Harumi took their daughters to stay with her parents in central Japan, far from the contamination, while Asami remained behind to work the farm. He didn’t know when they would feel it was safe enough to reunite. Junko and I were drawn to the resolve of farmers who made the choice to stay and cultivate. What gave them the resilience to carry on? Could they prove that Fukushima organic agriculture was anything more than an impossible contradiction? Could they keep their communities and way of life alive? The people of Fukushima didn’t use the electricity generated at Fukushima Daiichi. It flowed south to feed Tokyo’s insatiable energy appetite. After the disaster, billions poured into northern Japan to rebuild areas shattered by earthquake and tsunami. Neighboring prefectures have recovered resoundingly. But many in Fukushima feel they’ve been abandoned, left to bear the stigma of radiation, collateral damage to Japan’s powerful nuclear industry that much of the country would rather forget. It was a particularly harsh irony for organic farmers like Asami, who had worked so hard to keep their land and crops free from chemical pesticides and fertilizers, only to have contamination rained down on them. Many thought the meltdown would spell the end of Fukushima agriculture, and organic farming seemed especially vulnerable. Many gave up, moving away or retiring rather than take on the seemingly insurmountable challenge of cleaning their land and regaining the trust of a country made cynical by official misinformation about the crisis. The Japanese government was slow in warning the public about the meltdown and its attendant hazards, which led to ongoing widespread skepticism toward any assertions of relative safety. Based on food contamination levels and human exposure rates in Europe after the 1986 Chernobyl nuclear disaster, high levels of radiation were expected throughout the Fukushima food supply. It was clear early on that some foods produced near the plant—like fish, meat, milk, wild mushrooms and other wild plants, and some tree fruits—absorbed dangerously high levels of radiation and would have to be taken off the market. Rice, the staple of the Japanese diet, and thus the greatest potential source of internal radiation exposure, was the biggest concern. It took months of grassroots efforts by food producers and activists as well as regulators before a robust testing system was implemented. Once the first harvest was in, the fall after the disaster, testing found that most Fukushima rice and vegetables showed no detectible radiation. The reasons for this unexpectedly positive outcome are still being studied (as are the health implications of exposure to trace levels of radiation). Several apparent causes include the clay soil in Japan, which retains radiocesium—the most prevalent contaminant from Fukushima and Chernobyl—better than the sandy soil of northern Europe, keeping it out of plant roots; farmers’ diversion and filtering of mountain runoff, minimizing the recontamination of their fields; potassium fertilizer, which reduces crops’ uptake of cesium; and the abundance of organisms, particularly in organic soil, that absorb cesium before it reaches the crops. The test results were gratifying for farmers, but the data alone has not been enough to regain many of the customers lost in the days after the disaster. It is up to farmers, the local food industry, and agricultural communities to show why to choose Fukushima food over alternatives grown in southern Japan or imported from places like China and the U.S. In 2012, Harumi and the girls returned to Kitakata, opting for the uncertain risk of low-level radiation exposure over the stress of displacement and separation. 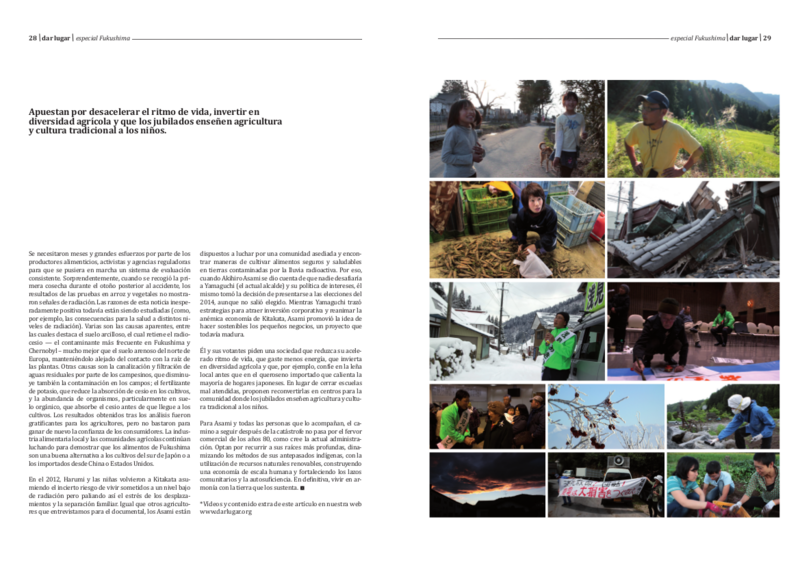 Like other farmers we feature in Uncanny Terrain, the Asamis resolved to stand their ground, to fight for their embattled community, to find ways of growing safe and healthy food on land contaminated by nuclear fallout. 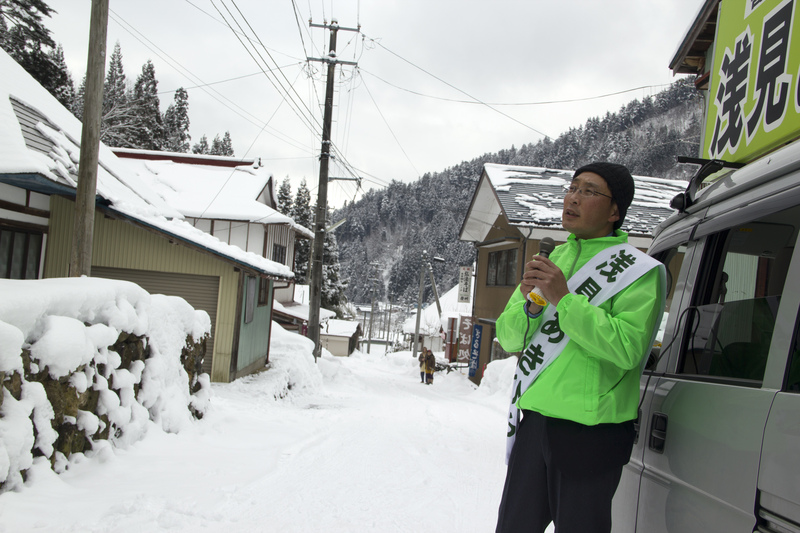 When he realized no one would challenge incumbent mayor Yamaguchi and his business-as-usual policies in the 2014 election, Asami concluded he’d have to step up himself. While Yamaguchi strategized about luring corporate investment to revive the anemic Kitakata economy, Asami called for a focus on incubating sustainable small business. Asami and his fellows call for society to slow its hurried pace, use less energy, invest in agricultural diversity, and rely for example on locally grown firewood over the imported kerosene that heats most Japanese homes. Rather than closing poorly attended schools, they advocate turning them into community centers where retirees can teach children cultural and agricultural traditions. For Asami’s compatriots, the way forward for post-meltdown Japan is not to reach for the long-lost commercial fervor of the go-go 80s, as the current administration would have it. Rather they want to draw on deeper roots, reviving their ancestors’ methods of utilizing indigenous, renewable natural resources, building an economy based on a more human scale, and strengthening community ties and self-sufficiency, living in harmony with the land that sustains them.